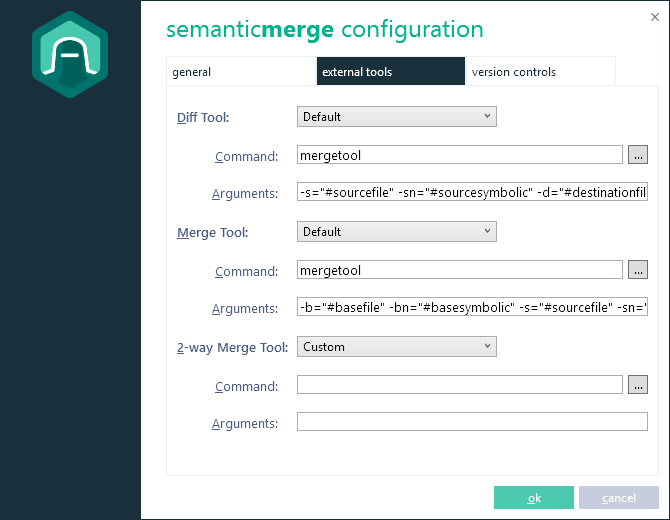 The SemanticMerge tool is a language-dependent source code merge tool. 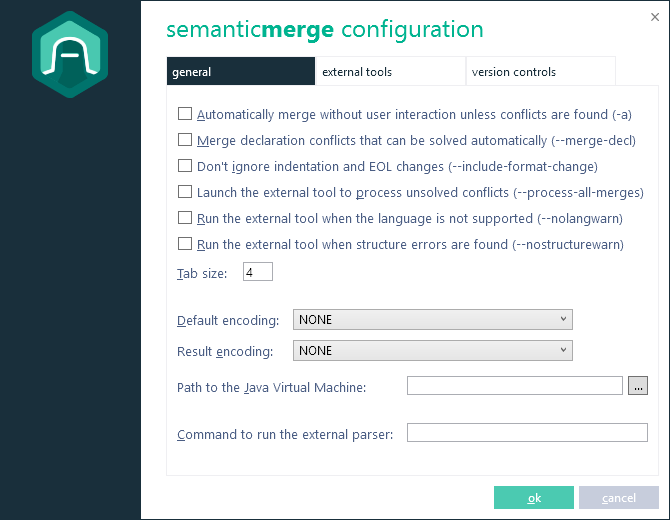 It can make a huge number of merge scenarios really easy - particularly ones that can't be managed by current text-based, language-agnostic, merge tools. Our SemanticMerge tool leverages the current merge technology of the merge tool included in Plastic SCM - which is already capable of dealing with refactors through Xmerge - and also the merge system of the Plastic SCM server itself, and combines them together with language-dependent parsing to create the ultimate source code merging machine. SemanticMerge is not limited to Plastic SCM. It can be configured to work with Git, Subversion, Perforce, ClearCase, Team Foundation Server, Mercurial, and many others. Our bundled JVM-base parsers require JVM version 8 or higher. 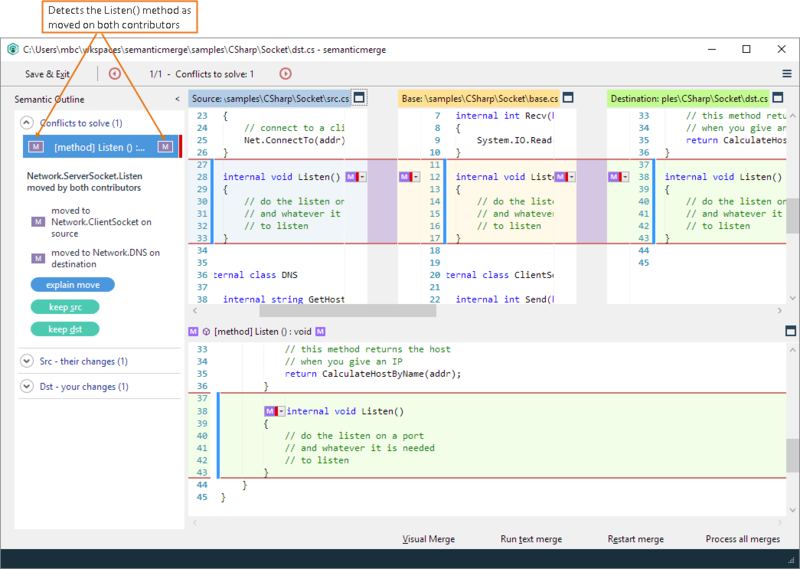 SemanticMerge includes C# 7 support. So .NET framework 4.6 is required. These days, software development is based on the "modify-merge" working pattern: developers work in parallel on the same codebase performing concurrent changes - potentially inside the same files - that will need to be reconciled back ("merged" in version control terms). In order to perform the merge, developers rely on "merge tools". All merge systems use text based algorithms. The tools won't actually consider the programming language the code is written in, only the modifications made to the text. This way, all merge tools are language-unaware, and hence, they all have a wide operation range. Not being able to act based on the specific programming language structures means that the merge tools are heavily dependent on the position of the texts being modified, which severely restricts developers' ability to perform changes concurrently and improve code quality and readability by refactoring. This merge would be a nightmare for any merge tool on the market, but at the end of the day there's not a single conflict, if you look at it from a programmer's point of view. You just made some refactors in parallel, that's all. And this is exactly what we get with SemanticMerge! Since it looks into the code structure and doesn't use a textual comparison method to compare the three contributors (it is a 3-way merge after all), the algorithm is not restricted by the relative positions of the texts it compares. Learn more about 2-way vs 3-way merge. Our tool parses the code, checks the obtained structures, and merges based on the "code trees" of the base plus the 3 contributors, automatically providing the expected result. As you can see, there are no pending conflicts to be resolved and the result file looks exactly how you expect. 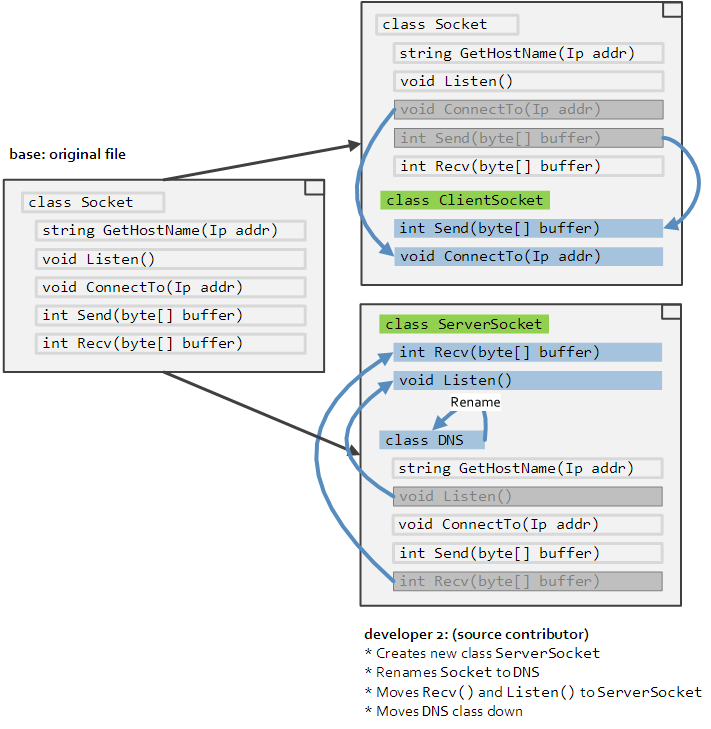 Let's consider again the scenario of the Socket class that is split into three classes. 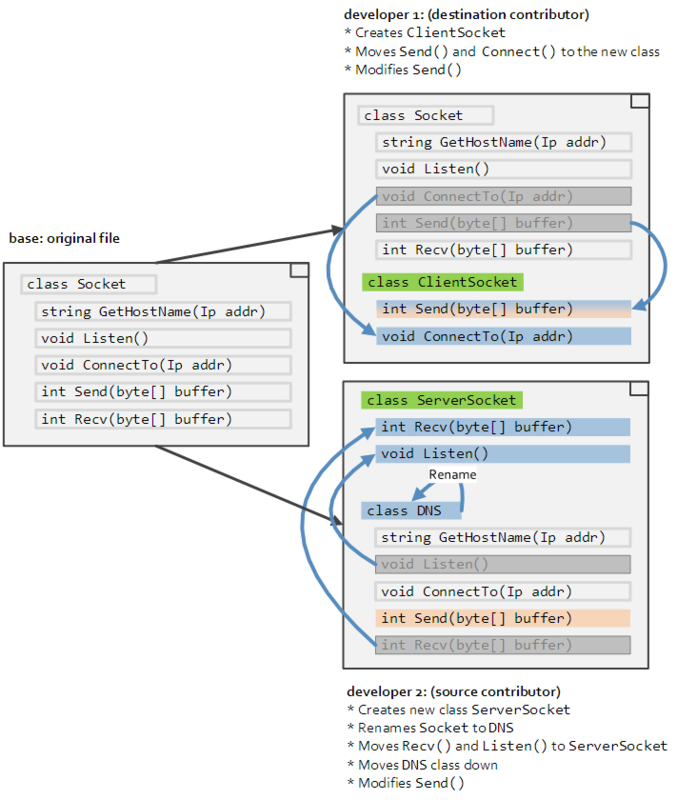 What if the two developers decide to modify the Send() method? As you can see, the tool only detects 1 conflict (try to do the same with a conventional text-based merge tool and you'll enter into nightmare mode). In my example, the merge has been fully automatic for the method too, since I didn't modify the same part of the method. 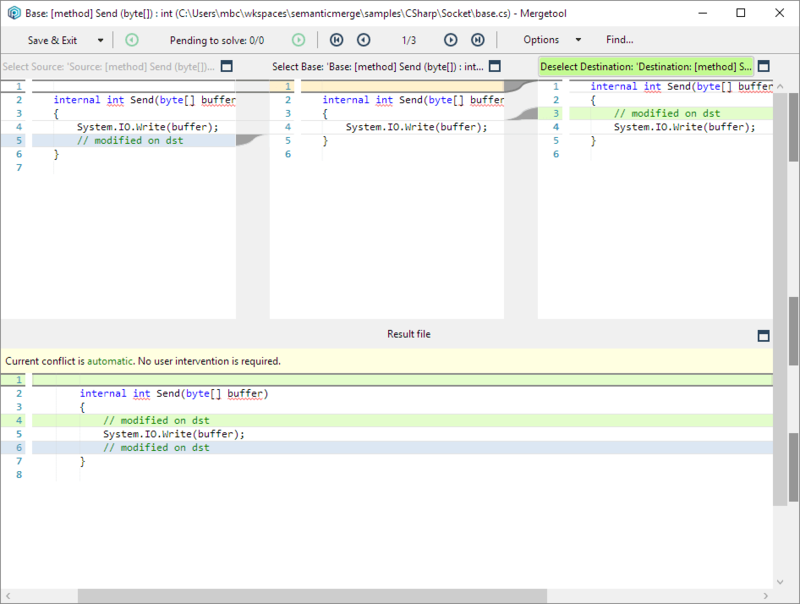 The advantage, as you can see, is that you use the divide and conquer method: you merge method by method (if needed) instead of the entire file, and SemanticMerge is able to detect the classes, methods, properties, etc. independently of their locations. SemanticMerge can track them when they've been moved, renamed, and more. After the previous merge cycle, now suppose we take the resulting file as the base for the next iteration. 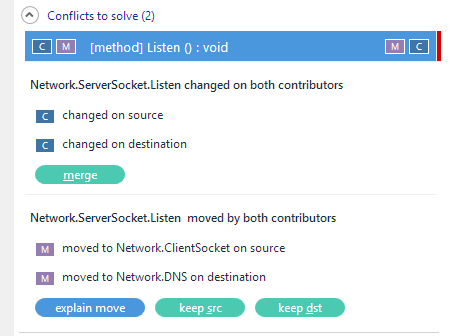 The developer running the merge can choose whether he wants to keep the method on the source location (keep src button), the destination (keep dst button), or even duplicate it, keeping both contributors. As you can see there is a "double conflict" on the method: you first have to resolve the changed/changed conflict and then the moved/moved. In either case, it makes easy a situation that would be close to impossible to deal with using traditional text-based merge tools. Suppose you always want to review conflicts if one method is modified in parallel - Text-based merge tools can detect when a block of text has been modified in parallel, but if you modified the first line of a method and someone else modified the last part, the merge will be automatic, even if there are potential logic issues. This is easily handled by SemanticMerge. Usings (or imports in Java jargon) are also handled by the system - If you add using System.Text on the first line and I add it on the fifth, SemanticMerge knows it is the same using so it will only add it once. Changed/deleted - Suppose you modified a method inside a subclass and I go and delete the class. SemanticMerge will deal with this specific case. The same holds true for many other scenarios like moved/moved, added/moved, and so on. 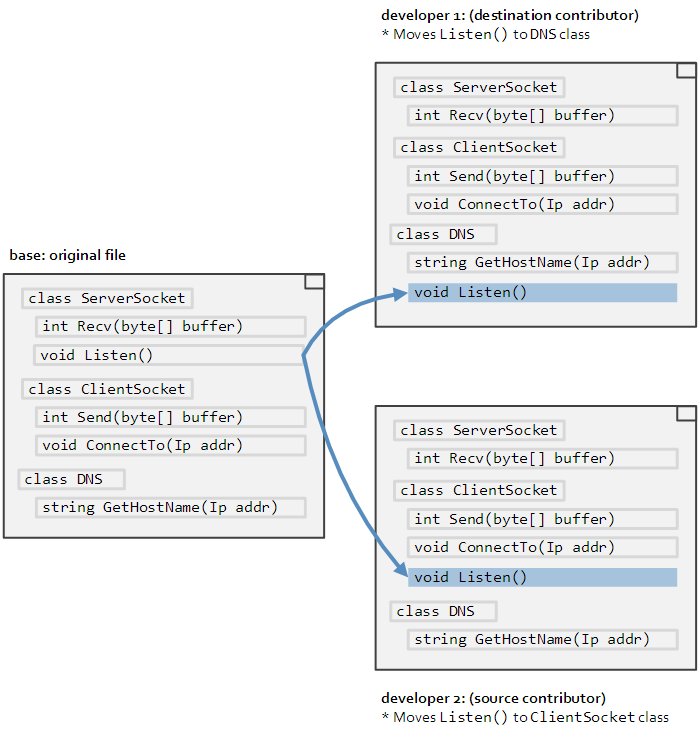 What if I modify two methods and you go and decide to rearrange the class based on visibility rules? Public goes first, then internal, protected, and finally private. It will be an automatic, easy merge for SemanticMerge. If we listed all the merge cases specifically handled by SemanticMerge, we'd be here all day. This short list, however, gives a pretty good idea of what the tool can do. SemanticMerge offers some options to consider when running the tool. 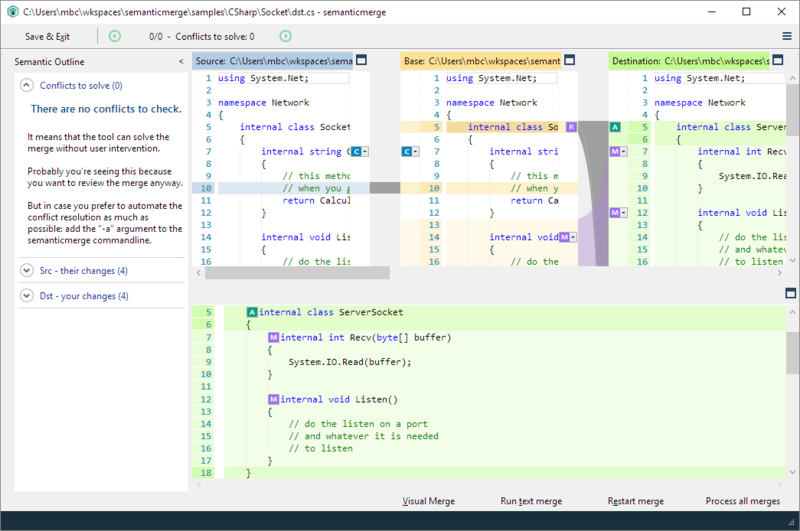 -a - Tells the tool to automatically merge until a conflict appears. Then, the user interaction is needed. --merge-decl - Merge automatically as many declarations* as possible. --include-format-change - Include changes where only indentation and EOLs have been modified. This includes differences in white spaces and tabs at the beginning of lines and differences in EOLs. It also includes white lines at the beginning of declarations. By default, all these differences are ignored to simplify the merge/diff. 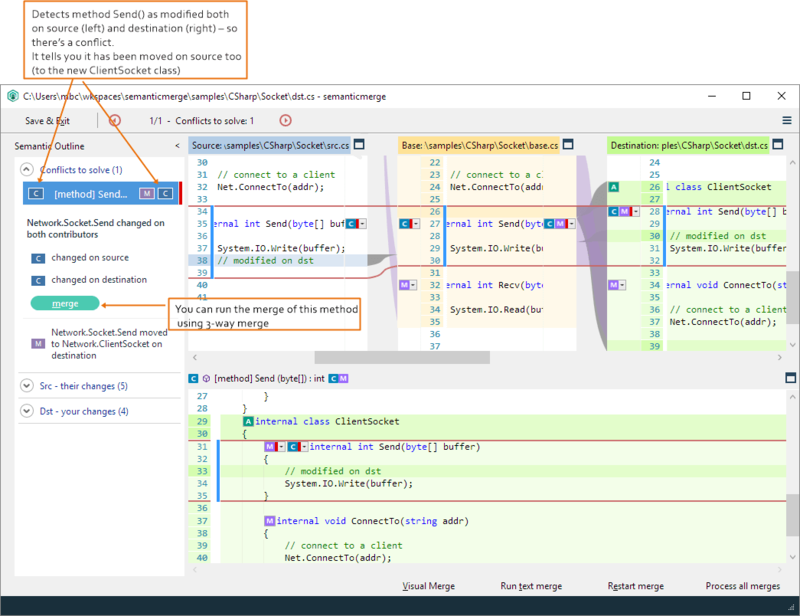 --process-all-merges - Merge automatically as many declarations* as possible and run the external text based tool for each non-automatic merge declaration. --nolangwarn - Skip the "no supported language" dialog, and directly launch the text-based tool. --nostructurewarn - Skip the structure errors dialog on startup and directly launch the associated text-based tool. Encoding - The way in which the content of the files is interpreted as text characters. Java Virtual Machine path - Specify where the virtual machine for Java is. External parser - Enter the command to run an external parser (if wanted). Learn more about External parsers. * A declaration is the statement that defines any of the supported syntax elements: classes, methods, attributes, etc. Depending on the element type (for example, classes, methods), they include a body where the element is implemented. Read some examples about how to configure some external tools. 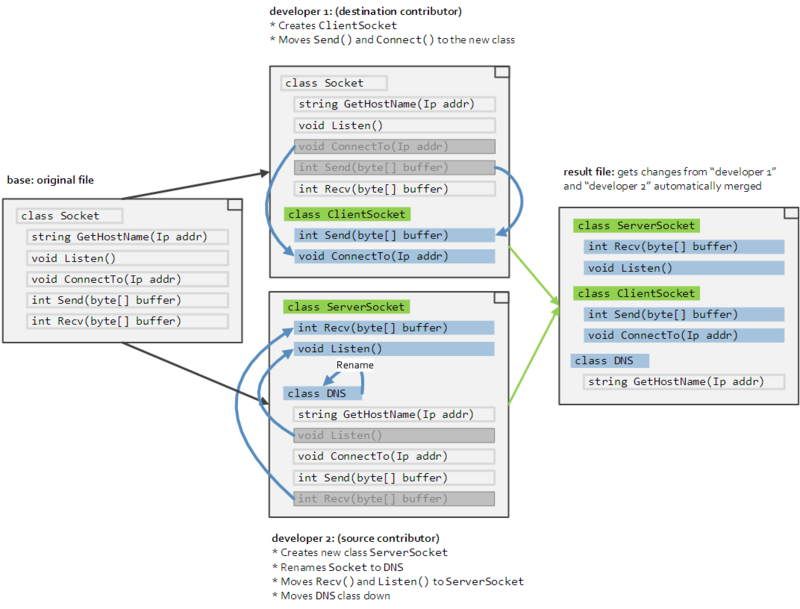 A semanticlicserverd init.d service will be automatically started afterwards. Use the licadmin command to generate the machine id. We will need this machine id to generate your license. Once you have the license ready, copy your license.lic file under the directory /var/lib/semanticlicserver (maybe you have to create the folder with root privileges). Every client working with the licenseserver must configure it by setting up the server address in the licenseserver.conf file .The file must contain a single line with the license server name or IP address. The file must be located under the SemanticMerge installation directory. The licadmin application allows the user to administrate the SemanticMerge license. generateid - Generates the id of this machine (required to build a license afterwards). list - Lists the current licensed users. licinfo - Shows info about the installed license. deactivateuser <user_id> - Removes an user identified by user_id from the licensed users list. help - Prints this help. Please check the .Net framework required version. Please check the minimun JVM required version. 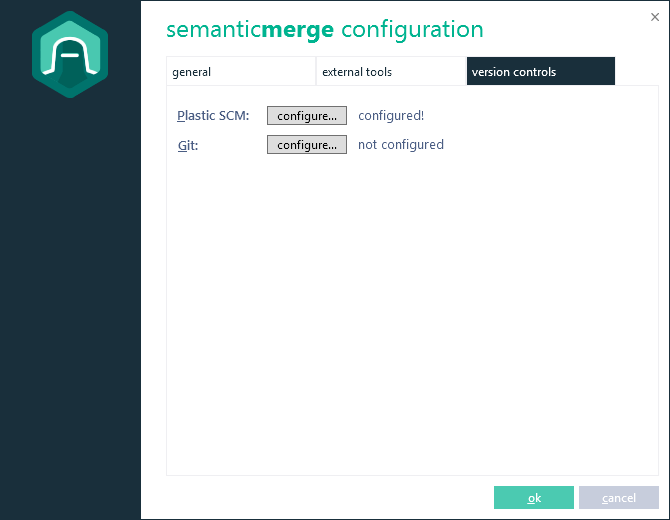 We included documentation about how to configure SemanticMerge. The documentation has been updated to SemanticMerge 2.0.